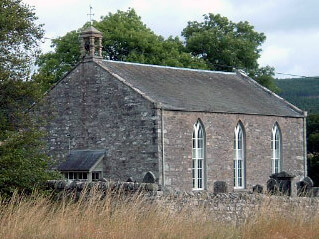 I’m sure that all Clan Society members, especially those who have already contributed to the Kirk, are still contemplating doing so, or may be thinking of doing so either a second time or on a more regular basis for the future, have been wondering about progress made by the Struan Kirk Trust since the purchase went through last August. Here is a first progress report. Other updates will follow. The Trustees are our Chief, Struan himself; Rev. Matthew Robertson who is a past Chaplain to the Society and a friend to the Kirk of very long standing; Struan Robertson of Pitcastle; Billy Duncan our Council Member, Hon. Piper to the Chief and himself an architect; and myself. We have appointed supervising architects, accountants and a corporate Secretary; completed (post the purchase itself which was effected via our Solicitors) the setting up of banking arrangements; contracted for power supply; arranged necessary electrical, asbestos, lead and bat surveys of the building; reassessed water supply requirements and needs; had essential/urgent repairs carried out to the entire roof tiling; and established a 2019 budget, order of magnitude £30,000, for the other basic work needed on various essential elements to improve the long-term condition and viability of the building. Three suitable local contractors have been invited to compete in tendering for the work. We anticipate starting a first phase of work in May and completion in July. A second phase will take place in October. Windows, doors, the porch, gutters and pipes, the septic tank, more roof work, ventilation, minor electrical works and some basic decoration are all involved. The principal reason for the two phases is, in a word, bats. Wildlife protection regulations in Scotland and the U.K. in general are very strict and are more than usually so for bats, where they vary depending on seasonal activity. Work which might disturb roosts whether bats are present or not is closely controlled. I doubt if many members want all the details, but for anyone interested, the long-eared brown bat is one species currently in residence and hibernating! There are several others. While the pre-purchase condition report commissioned by the Society proved extremely helpful to the founders of the Trust in reaching the decision to purchase (and most of the cost of that work has been recovered by the Society from the Trust) further exploratory work on all aspects of the condition confirms that the Trust will need to raise significant additional funding in the coming years if we are to complete all essential repairs and ideally have a "sinking fund" for longer term maintenance. The Trustees are exploring various avenues, including the possibility of obtaining outside grants such as matching Heritage Lottery funding, but it is clear that the Society will need to continue its own fund-raising efforts to continue to support the Trust. The Trustees have agreed to provide a handsome leather-bound book, to stay in the Kirk, in which will be recorded, in suitable calligraphic form, the names of significant individual or group donors who would like to be so recognised. The Society too will recognise publicly significant individual or branch donations. Further details to follow. In the meantime I am delighted to confirm that contributions/giving to date via our own Kirk fund bank account from the Society’s individual members and branches have now marginally exceeded the £20,000 total which the Society originally committed to the Trust for the purchase and initial works programme. This has been achieved without our having to call on our central funds (although members will recall that approval to do so if necessary had been given at last year’s EGM). It is a heart-warming effort. Events at the Kirk since its acquisition by the Trust have included House of Bruar’s Christmas 2018 carol service for its employees, and this year are expected to include a rather special event: our Clan Secretary’s marriage! The Trustees’ future focus will include how to attract more (suitable of course) events and usage to the Kirk once the planned works have been completed. Advice from anyone with local knowledge/connections is especially welcome.